A. Landlord is the owner of certain "Land" (defined below), upon which is constructed the "Building" (defined below). B. Landlord desires to lease to Tenant and Tenant desire to lease from Landlord the entire rentable area of the Building. 1. PREMISES. 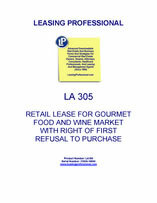 Landlord hereby leases to Tenant, and Tenant hereby leases from Landlord, upon the terms and subject to the conditions of this Lease, the entire rentable area (the "Premises"), consisting of approximately _______ rentable square feet of retail space, in that building, and all appurtenances thereto, including the bakery use permits as they currently exist, located in ________________________ (the "Building"), which Building is located on the certain real property more fully described in Exhibit A attached hereto (the "Land"). The location of the Building on the Land, the "Common Areas," the "Adjacent Building" (as those terms are defined below), entrances, exits, driveways, parking areas and service drives are depicted on the drawing attached hereto as Exhibit B. 2.1 INITIAL TERM. The initial term of this Lease ("Initial Term") shall commence on _____________, (the "Commencement Date") and, unless sooner terminated, shall expire ________ (__) years after the Commencement Date (the "Expiration Date"). As used in this Lease, "Month" shall mean a calendar month, except that if the Term begins on a day other than the first day of a calendar month, the first "month" shall be the period from (and including) the Commencement Date through (and including) the last day of the calendar month in which the Commencement Date falls, and if the Term ends on a day other than the last day of a calendar month, the last "month" shall be the period from (and including) the first day of the calendar month in which the Term ends through (and including) the day on which the Term ends. The term "Lease Year" shall mean each twelve (12) month period from and after the Commencement Date and each anniversary thereof. If the Commencement Date occurs on a date other than the first day of a month, the first Lease Year shall include the partial month and the next twelve (12) full calendar months. 2.2 EXTENSION OPTION. Provided that Tenant has not assigned this Lease, or sublet any or all of the Premises (it being intended that all rights pursuant to this provision are and shall be personal to the original Tenant under this Lease and shall not be transferable or exercisable for the benefit of any transferee), and provided that Tenant is not in default under this Lease, Tenant shall have options (each an "Extension Option") to extend the Term for up to four (4) additional consecutive periods of three (3) years and thereafter for up to two (2) additional consecutive periods of five (5) years (each an "Extension Period"), by giving written notice to Landlord of the exercise of any such Extension Option at least six (6) months, but not more than twelve (12) months, prior to the expiration of the Initial Term or the prior Extension Period, as the case may be. The exercise of any Extension Option by Tenant shall be irrevocable and shall cover the entire Premises leased by Tenant pursuant to this Lease. Upon such exercise, the Term of the Lease shall automatically be extended for the applicable Extension Period without the execution of any further instrument by the parties; provided that Landlord and Tenant shall, if requested by either party, execute and acknowledge an instrument confirming the exercise of the Extension Option. The failure of Tenant to exercise any Extension Option, or the expiration or termination of the Lease, shall terminate Tenant's right to exercise any subsequent Extension Option and Tenant shall have no further right to renew or extend this Lease. Any extension of the Term shall be upon all the terms and conditions set forth in this Lease and all Exhibits thereto, except that (i) Tenant shall have no further option to extend the Term of the Lease, other than as specifically set forth herein; and (ii) Rent for any such Extension Period shall be equal to the then Fair Market Rent (as defined below) for the Premises for the space and term involved, which shall be determined as set forth below. (a) "Fair Market Rent" shall mean the "fair market" rentals at the time or times in question for the applicable space, based on the prevailing rentals then being charged to tenants in other retail buildings in the general vicinity of the Building of comparable size, location, quality and age as the Building for leases with terms equal to the Extension Period, taking into account the creditworthiness and financial strength of the tenant, the financial guaranties provided by the tenant (if any), the value of market concessions (including the value of construction, renovation, moving and other allowances or rent credits), the desirability, location in the building, size and quality of the space, tenant finish allowance and/or tenant improvements, included services, operating expenses and tax and expense stops or other escalation clauses, and brokerage commissions, for the space in the Building for which Fair Market Rent is being determined and for comparable space in the buildings which are being used for comparison. Fair Market Rent shall also reflect the then prevailing rental structure for comparable retail buildings in the general vicinity of the Property, so that if, for example, at the time Fair Market Rent is being determined the prevailing rental structure for comparable space and for comparable lease terms includes periodic rental adjustments or escalations, Fair Market Rent shall reflect such rental structure. (b) Landlord and Tenant shall endeavor to agree upon the Fair Market Rent. If they are unable to so agree within thirty (30) days after receipt by Landlord of Tenant's notice of exercise of the Extension Option, Landlord and Tenant shall mutually select a licensed real estate broker who is active in the leasing of retail space in the general vicinity of the Property. Landlord shall submit Landlord's determination of Fair Market Rent and Tenant shall submit Tenant's determination of Fair Market Rent to such broker, at such time or times and in such manner as Landlord and Tenant shall agree (or as directed by the broker if Landlord and Tenant do not promptly agree). The broker shall select either Landlord's or Tenant's determination as the Fair Market Rent, and such determination shall be binding on Landlord and Tenant. If Tenant's determination is selected as the Fair Market Rent, then Landlord shall bear all of the broker's cost and fees. If Landlord's determination is selected as the Fair Market Rent, then Tenant shall bear all of the broker's cost and fees. (c) In the event the Fair Market Rent for any Extension Period has not been determined at such time as Tenant is obligated to pay Rent for such Extension Period, Tenant shall pay as Rent pending such determination, the Rent in effect for such space immediately prior to the Extension Period; provided, that upon the determination of the applicable Fair Market Rent, any shortage of Rent paid, together with interest at the rate specified in the Lease, shall be paid to Landlord by Tenant. (d) In no event shall the Rent during any Extension Period be less than the Rent in effect immediately prior to such Extension Period. (e) The term of this Lease, whether consisting of the Initial Term alone or the Initial Term as extended by any Extension Period (if any Extension Option is exercised), is referred to in this Lease as the "Term." The monthly rent for the Premises under either Subsections 3.1 is referred to herein as "Rent." Rent shall be payable in advance on the first day of each and every calendar month during the Term, except that Rent for any partial month at the beginning of the Term shall be paid on the Commencement Date. Rent for any partial month at the beginning or end of the Term shall be prorated based on the actual number of days in the month. Rent is payable in lawful money of the United States of America, which Tenant agrees to pay to Landlord, without deduction or offset, except as expressly provided herein, at such place as may be designated from time to time by Landlord. Tenant shall also pay to Landlord a sum equal to fifty percent (50%) of any real property taxes levied upon the Land (after taking into account any abatement or refund of taxes received by Landlord). Any such taxes during each succeeding taxable year shall be payable in twelve equal monthly installments to the Landlord, payable the first of each month commencing on the Commencement Date. The term "Additional Rent" shall mean all payments required to be made by Tenant under this Lease for real property taxes, insurance, and Tenant's "Proportionate Share" (as defined below). There shall be no security deposit. 4. APPURTENANT RIGHTS IN COMMON AREA. (a) Tenant and Tenant's employees and customers shall have the non-exclusive easement and right to use, in common with Landlord and all other occupants of the "Property" (defined below) and all persons having business with Landlord and such other occupants, without charge, the parking areas in the Property owned by Landlord in which the Premises are located and all other areas and facilities of the Property designed or intended for common use, including without limitation "Common Areas" as defined below. The term "Common Areas" means all areas and facilities outside the Premises and within the exterior boundaries of the Property, but not including the Adjacent Building, that are provided and designated by Landlord for the general use and convenience of Tenant and of other tenants of the Property and their respective authorized representatives and invitees. Common Areas shall include, at a minimum, all pedestrian walkways, landscaped areas, sidewalks, service drives, parking areas, entrances, exits, driveways and roads, substantially as depicted on Exhibit B. (b) Landlord shall maintain the parking areas, landscaping and other Common Areas of the Property, for which Tenant shall reimburse Landlord fifty percent (50%) of the reasonable costs thereof ("CAM Charges"), except for those items expressly stated in this Lease as Landlord's responsibility.